Enderun Colleges has one of the leading culinary programs in Manila, and so I was very curious to try out the Restaurant 101 located in the campus. My family and I headed over there for lunch during my holiday in Manila. The place is a delightful restaurant that showcases the creations of the Enderun faculty and serves as a training ground for its students who help out as part of the wait staff. 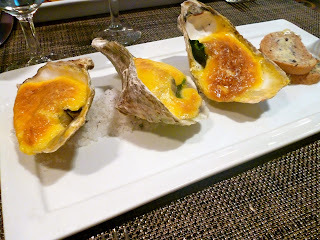 For appetizers, we ordered Gratinated Oysters (Php 180 or SGD 5.40). These were baked oysters with cheese and spinach. Really loved how the toasted cheese and butter complemented the fresh oysters. Absolutely delicious! My sister had the Mushroom Cappuccino (Php 260 or SGD 7.70). Had a sip out of this and thought this was really nicely done. 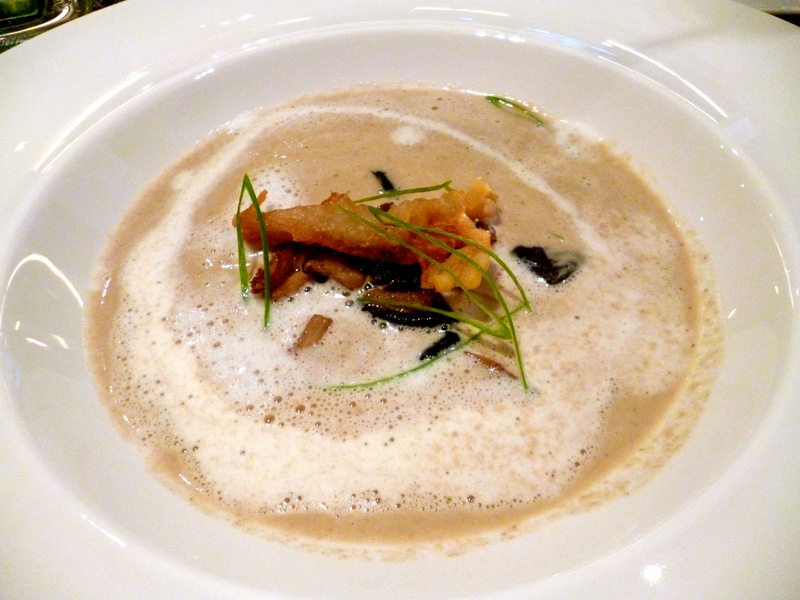 Not overly creamy and the mushroom had a pleasing distinct taste. 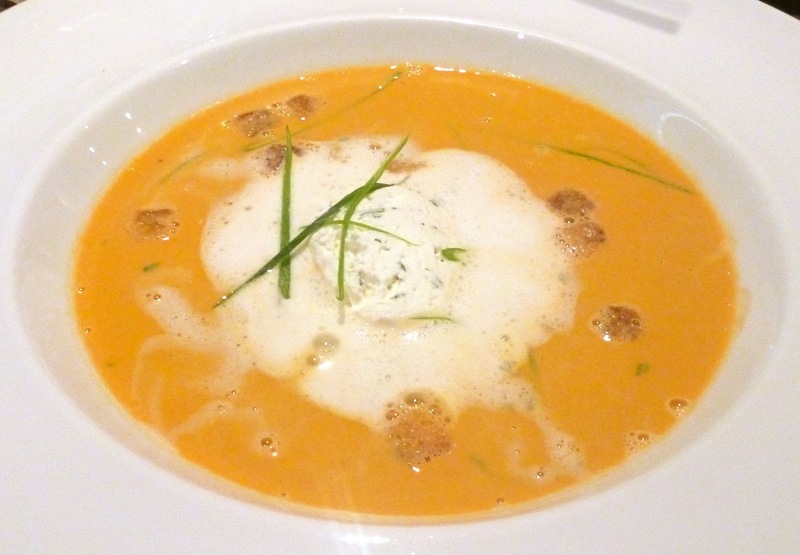 My dad had the Crab Bisque (Php 240 or SGD 7.10). Cannot comment on the taste as I didn't get to try it out. My dad seemed to like it but could not finish the whole bowl as I guess it was a little on the heavy side. 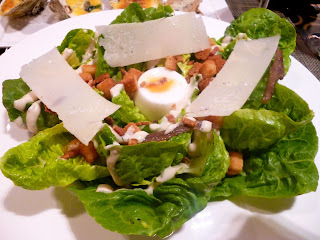 I had the 101 Caesar Salad (Php 300 or SGD 8.90). I thought it was presented beautifully. This had whole strips of parmesan and anchovy on a bed of extremely crunchy and sweet lettuce. There was also a poached egg in the middle which added depth to the greens. This is one of the better caesar salads I've had. The dressing was savory without being too overwhelming which is normally the pitfall of caesar salads. 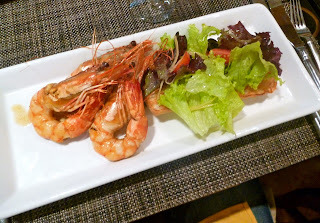 I really enjoyed this, and I can see myself going back here for this salad alone! For mains, I had the 101 Truffle Pasta (Php 420 or SGD 12.50). I thought it was rather cute and playful that they used macaroni for this. It had chunks of ham and gruyere cheese as toppings. I thought however that they could have used less gruyere cubes. 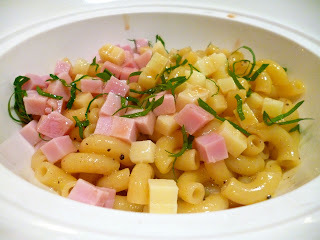 The gruyere made it a little too heavy and tiring to finish, and it overpowered the truffle flavor of the pasta. 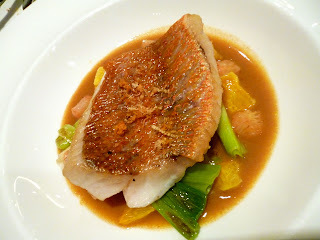 My sister and dad both had the Braised Sea Bass (Php 880 or SGD 26.10). The sauce was a coconut cream sauce with calamansi (Asian version of lime). Had a bite of this as well and thought the combination of coconut and sea bass was surprisingly good. The vegetable roll on the side was a visually appealing addition to the dish but unfortunately did not add anything taste-wise. A simpler side of greens may have been better suited. 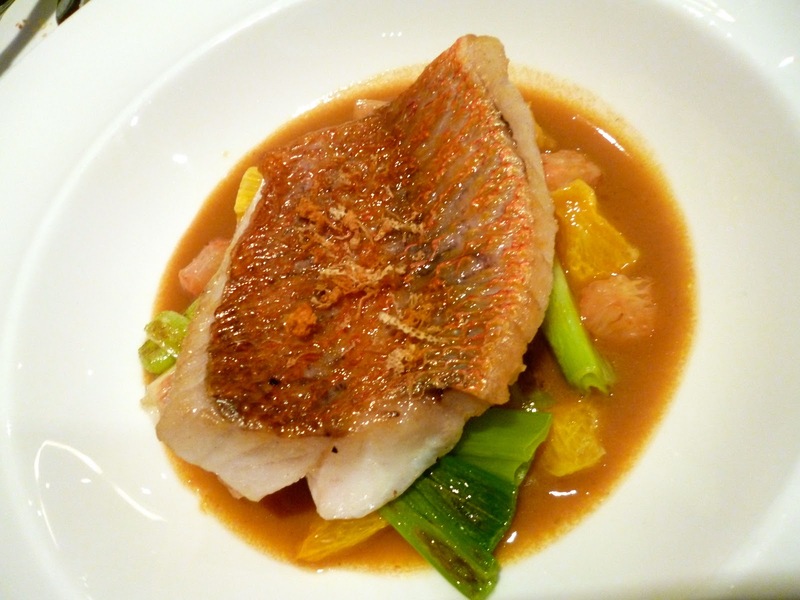 My mom had the Pan-seared Red Snapper (Php 480 or SGD 14.30). My mom thought the sauce had a nice hint of curry. Didn't get to taste this, so I don't have any personal comments. My husband ordered a 2-course Market Menu (Php 780 or SGD 23.20). The first course was a Prawn Appetizer (didn't really get the exact name of this) and the second course was a Pan-Seared Hanger Steak. Serving size was very generous, and quality was not bad at all for Php 780. For dessert we had the Louis XV (Php 280 or SGD 8.30) which was a chocolate crisp with delectable ganache and praline. Highly recommended for chocolate lovers like me. 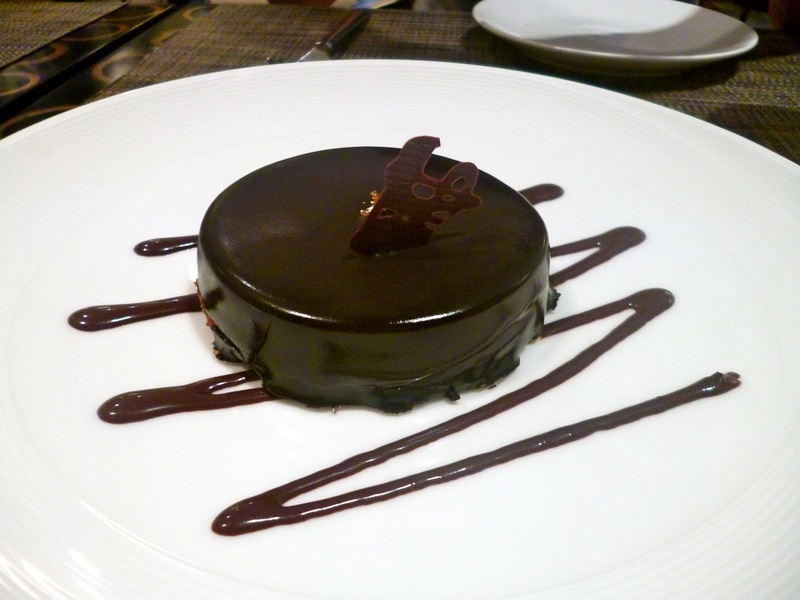 Very much enjoyed the crispy base with the sinfully good hazelnut chocolate. 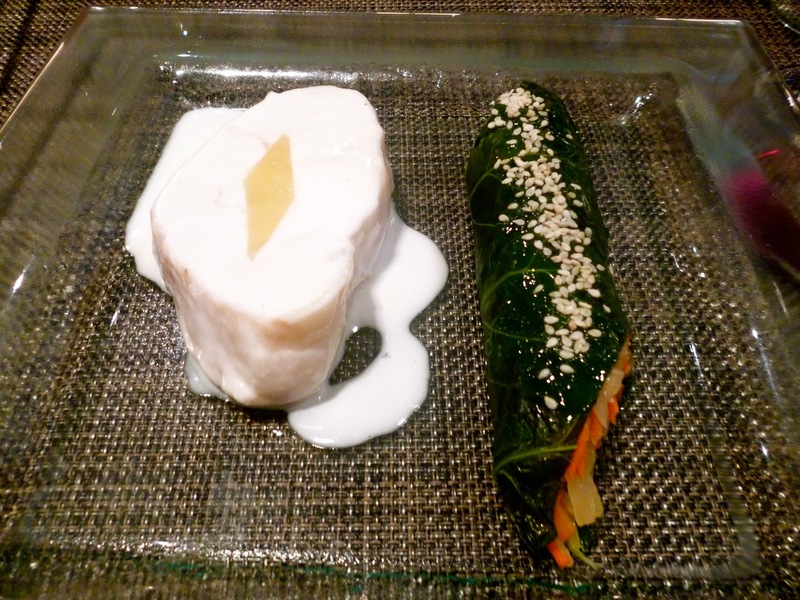 My first visit to 101 Restaurant was overall a very pleasant experience. There were some impressive dishes, and I could definitely see myself coming back for the oysters, caesar salad, and Louis XV dessert. 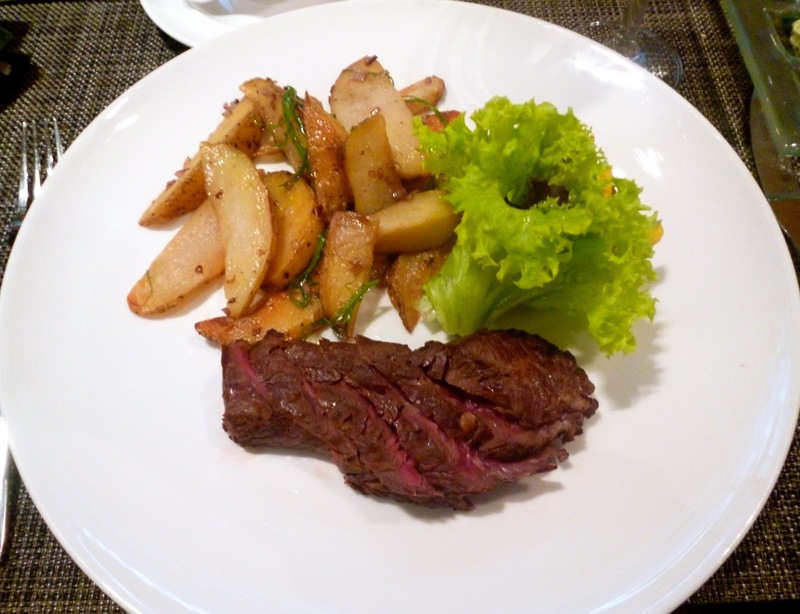 The other steaks and poultry dishes in the menu look interesting and would be worth a try in the future. Service was pretty good, considering that half the wait staff were students. They apparently have very affordable lunch set menus during weekdays which makes this ideal for the office crowd around the McKinley Hill area.